My 73 year old mom does all my binding as I've never wanted to attempt it. The way you demonstrate it looks good and maybe I'll give it a try and give my mom a break. 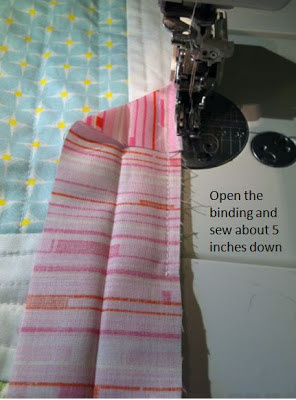 Great tutorial for the binding. I like the close up pictures and easy to follow instructions! Thanks! Thank you. This is a great tutorial!! I'm going to practice on a "mug rug" today. 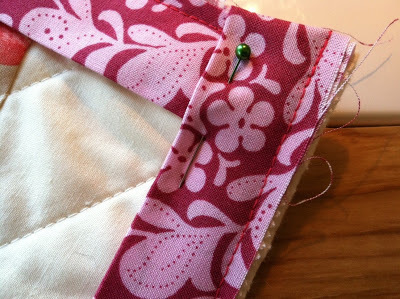 I have never sew a quilt before…your tutorial really inspired me to start with one. Look so simple and easy. Thank you very much for sharing. Great pictures and tutorial! I wish I had this before I finished my first quilt. Now I enjoy the blindstiching so much. Just some metres to go and the quilt is really done. I really need to thank you for this tutorial. 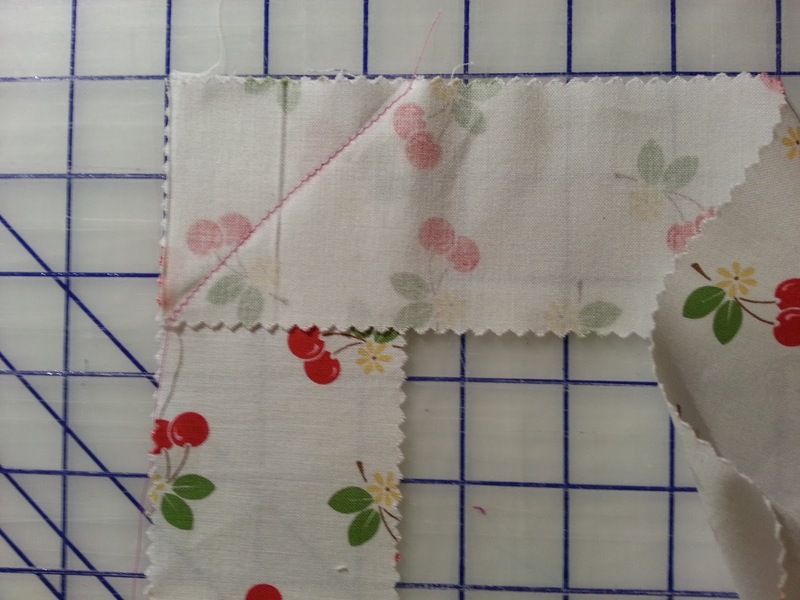 I have not made many quilts completely mostly because of the binding and quilting portion. Recently, I made some baby bibs for my little nephew who is to be born in September. They remained not complete because of the binding. Well, you'll be proud because TODAY they are finished because of this tutorial. Thank you so much. Hey thank you for such a clear demonstration of how to bind. I just finished a wee mug rug using your method and it looks great – really great! So simple when you know how! Thanks you help me , I loved your blog . I'm new to your blog! I just ran into this tutorial! After giving up on handsewing binding for Christmas gifts I went to machine binding…didn't fall too much in love with it. 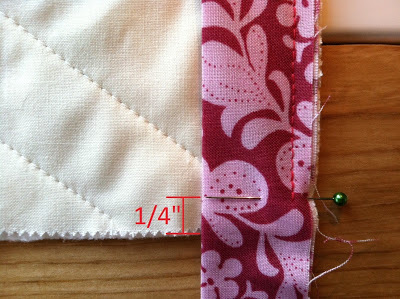 You made this SO easily understandable and I am for sure going to give it a try on my next quilt (I just ordered Ruby fabric from you)! Can't wait! Thanks for this. 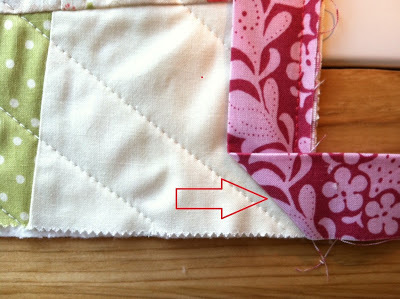 I'm new to the blog, found it through Pinterest and am delighted to find a tutorial with the corners clearly photographed! I struggle with them sometimes on my quilts! I have reviewed LOTS of binding and blind stitching tutorials and videos, and your is, by far, the best I've come across. Thank you so much, and I look forward to seeing more! Does anyone know how to do a blind stitch by machine? I've always done it by hand, but would love a quick alternative on occation. Thank you so much for the videos! I've never understood how when someone tries to 'tell' me and this is so much easier now! I'm sure I can do this! 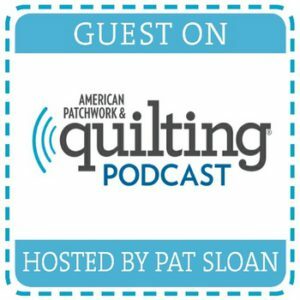 I've sewn forever but am new to quilting . . . took a beginner class and got interrupted before doing the binding. So I've been watching tutorials to refresh my memory before tackling it. Your pictures and explanations are among the best I've seen . . . Thanks so much. I'm going right to the sewing room to get started!! That was really helpful and as clear as a bell especially the knot tying thank you I could not have got a clearer view evev if I was in person! This tutorial might be lost on me… im not sure i understand the purpose of this tutorial. 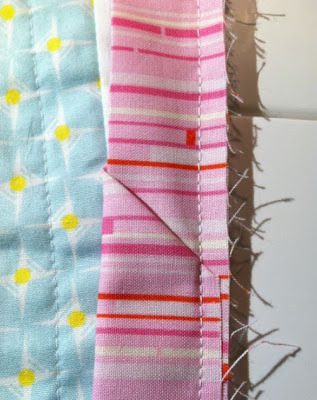 is it simply to hide the binding stitches? It does not look secure enough to use on a well used quilt. Would you then only use this on wall hangings or table top peices? 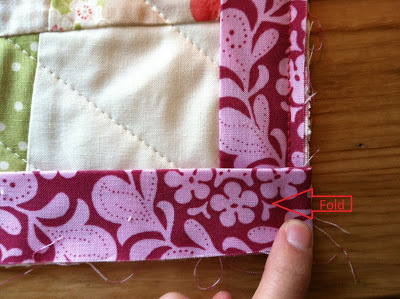 I'm a beginner self taught quilter and i have not had to bind like this ever, how durable is this process…? Hi!! 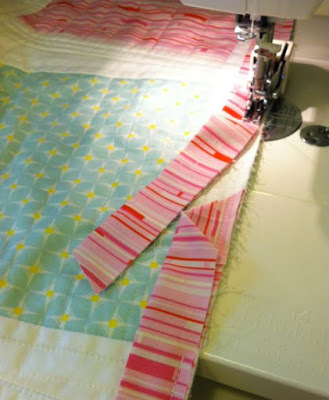 I am not a novice quilter, I have made about 6 or so, but I have always hated doing the corners…until I found your tutorial that is!!! 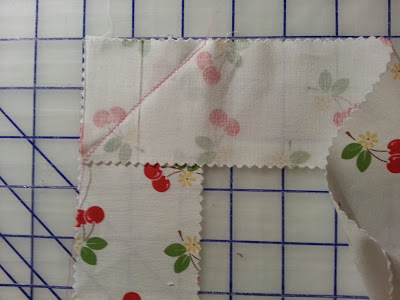 I am just busy doing the hand-stitching on the binding on my latest quilt, and I am over the moon happy with the corners. They are the neatest nicest corners on any of my quilts so far. THANK-YOU!!!! Great tutorial. Thank you for putting it together. 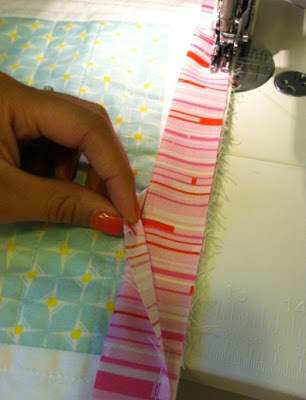 Why can't you machine stitch instead of blind stitch the last part of the binding? I'm a complete beginner but machine stitching sounds more durable and a lot faster. Thanks. Great ..thanks so much !! thanks to share with all of us !! 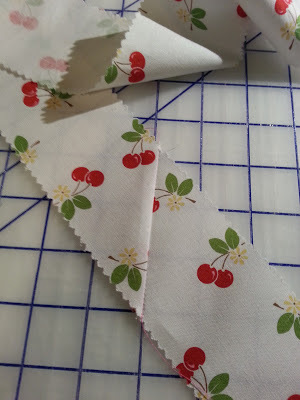 I'm making a quilt for the first time ever and I'm not all that familiar with sewing (much less sewing terms, haha!). 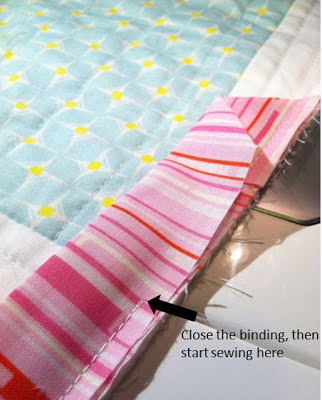 I found a great tutorial for the quilt itself but I kept seeing "blind stitching" when it came to the binding part. I did SO many google searches on how to do it and it just didn't make sense. But your video was EXTREMELY helpful and made perfect sense! So thank you for this!!! I'm so glad she shared your link. I have a baby quilt for my neice that is ready for the binding. I've been scared to do that part and now have the confidence I need to get it done. I can't say thank you enough for sharing this. Great tutorial. I have followed your binding procedures, a lot easier. Thanks for sharing! 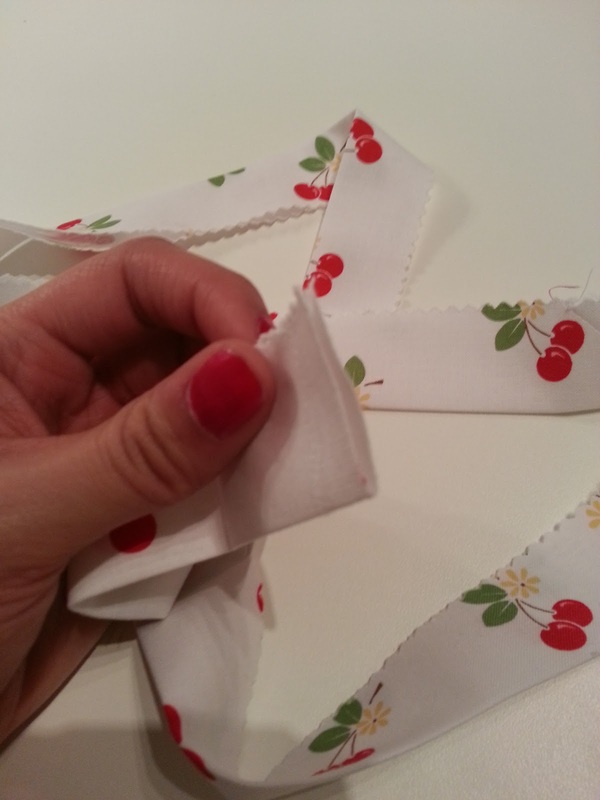 Sandi Henderson binding fabric! I love it! Don't you hope they will rerun those fabric lines again? Thanks for the great tutorial. I am going to try it on the next quilt. I like the way that you nest the end of the binding, so you don't have to join it. Brilliant!! This is an excellent tutorial! Thank you so much for writing it. 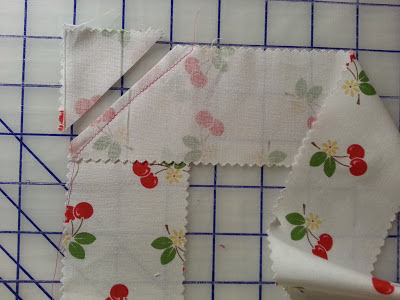 I am just getting started with quilting and your tutorial for machine-binding has been the very best one I've found. Thanks again! Thank you so much for this fantastic tutorial!! 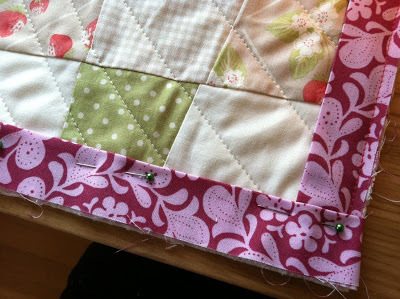 I have just been stitching straight across for years and never really thought (I don't know why…) to do it any other way. This method is so clean and neat! Thank you, thank you! 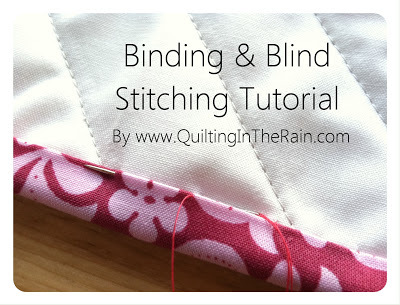 This is a really informative tutorial, which makes blind stitching so easy. Rally Blinds Cleaning Company comes with the service of blind parts repair. Hence, you can avail this service if required. Your tutorials are absolutely wonderful. They are little works of art. It is easy to tell someone how to do something, but you've made it so clear that even a novice would have no problems. Thank you for sharing your talent. Much happiness to you and your new house and little one. Perfect tutorial. You have provided each and every information in detailed manner. Due you know simple and effective ways to stitch curtains? WOW! i just found your blog by “accident” and this is the most awesome way to bind I have ever seen!!! THANK YOU! 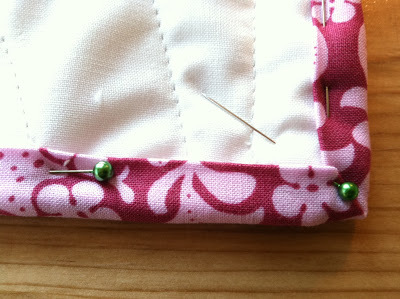 no more pinning and shoving under the sewing machine or sewing the binding on the wrong diagonal. so excited! can’t wait to finish my next quilt! hahaha! Thank YOU! I hope I can do you proud on my quilt waiting on me to get my confidence up to try this. I will refer back as I sew my binding . 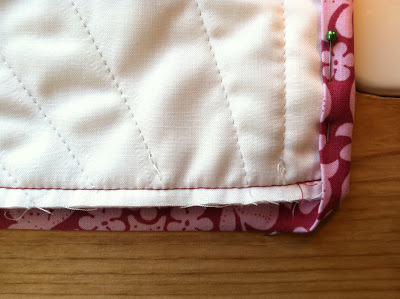 I am searching for a simple explanation on how to sew a binding to a fleece blanket with batting in between. This is for a friend. I presently am not able to use a sewing machine and must do the whole procedure by hand. Ii shouldn’t be that difficult, Manly I am wanting to what is the best stitch to use with 2 layers of fleece and a batting between the two. I am using the hand tacking for the blanket and that is a another whole problem. But i can overcome this. just the binding is very trying. This blanket is for a baby (child) and needs to be sturdy. If my right ankle was not fractured I would be using the old faithful the sewing machine. Help please. Thank you in advance.